Thursday morning las Juanistas called to see if we wanted to get our wine blessed. The Sisters of John are the nuns that serve in the Catholic Church down the street, and are committed supporters of the work that we and other organizations are doing in Colombia. On December 26th there is a special mass to bless the wine for your New Year's party, and following is a little open house at the sister's for a few lucky radical folks, including us. The mass was an amazing combination of unlikely visuals and sounds. First of all, not only had everyone brought there wine bottles up to the altar and set them in a row, there was also a section of the front pews roped off for the bride and groom! Weddings get slipped into whatever Mass is most convenient; you rarely have a separate wedding service. In the photo you can see in the right top corner, as Christmas star that was cycling through color combinations usually seen only in Las Vegas. The worship music was led by a terrific classical guitar player who was plugged in and cranked up. My musical brain started to get goosebumps when they started a praise song based on the Beatles', Hey Jude. Later they played another one based on the Battle Hymn of the Republic. 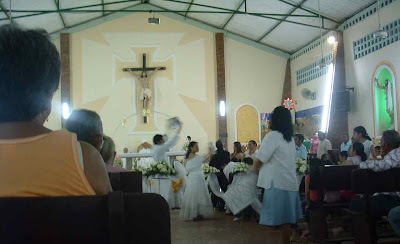 The finale was when the communion elements were danced up the aisle from the back of the church by a young couple twirling and weaving and bobbing to a traditional rhythm. See photo. Eventually, after we got the wine blessed, the couple married, and headed over to the house for some little disposable cups of wine and tasty sausages on toothpicks. There were nearly forty of us on plastic chairs lining the walls of a good-sized living room with all the locals singing songs friendship and hope for the future. It was a beautiful evening.